65 y.o male with prior surgery 23 years ago, secondary to trauma involving C4-5, C5-6 ACDF procedures. 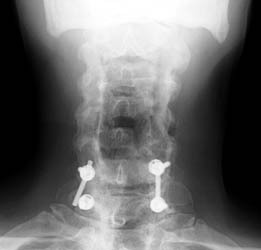 Now is 1 yr s/p bilateral C5 and C6 foraminotomy and C6-C7 posterior fusion and right iliac crest bone graft for persistent numbness and tingling for 2 years. 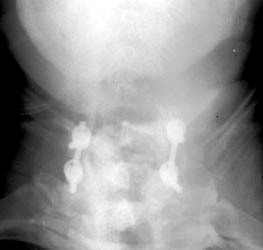 Radiographs obtained 5 months post-operatively demonstrate normal C6-7 fusion without evidence of hardware failure. 3 months later, follow-up films show the posterior fixation at C6-7. Now noted that the screw at C7 has slipped off the support rod on the right.